Your student loans are counted as part of your total debt when you apply for a mortgage. There are two potential ways this can affect your application. First, it will lower the possible mortgage limits you can receive. Second, if you have no paid off your loans on time, you may see higher rates or a harder time securing a loan. It is best to pay off your student loans prior to applying for a mortgage if possible. Your mortgage limits are determined by your income. Your credit score does not truly affect the limits you can secure on a mortgage. Income, however, does not exist in a bubble. Your income is relative to the other obligations you have each month or each year, such as outstanding debts. This comparison is called your income to debt ratio. If you have a very high amount of debt, you will need to have a very high income in order to show you can still afford monthly mortgage payments. If your student debt is high, consider these options to secure a high limit loan. Reduce all other debt to as low as possible. For example, pay down your credit cards, pay off any personal loans and automobile loans. These loans should be smaller than your remaining student loan debt, so they will be easier to pay off. Consider filing for a joint mortgage. You and your spouse can file together, adding your incomes into one lump sum. This sum is then compared to your total debt as a couple. If your spouse has low to no debt, the total debt to income ratio will be tipped in your favor. Your mortgage rates depend primarily on how you have performed on past debts. This is measured by your credit score. 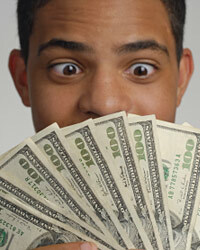 You may have a high amount of debt but maintain a very high credit score. This is possible if you repay your debt on time each month. However, if you have failed to meet your obligations to pay your student debt, your credit score may be low. Refinancing the debt, choosing extended terms, deferring payment and otherwise modifying the contract will also lower your credit score. A mortgage lender will become concerned if the debt has not been reduced or paid off in a time table appropriate to the size of the debt. You can overcome this issue by ensuring you pay your student loans on time for at least 2 years leading up to the time you apply for a mortgage. Increase the amount you are paying monthly to reduce the principal sum. This will show the lender you are on track to pay down the student debt obligation on schedule. If you deferred your loans in the past, consider providing an explanation for this action to your new potential lender. The lender will be more likely to work with you if the lender sees you are no longer struggling to make your student debt payments at this point.